Safe drinking water is a necessity for human life. A community that cannot provide water to its citizens, due to either natural or human contamination, cannot be sustained for long. Since 1995, 97 to 99 percent of community water systems1 have met all microbiological standards, and 87 to 93 percent have met chemical standards; earlier data are not available for comparison. The state has set targets for both of these standards at 95%. We have met them for microbiological contamination and we are very close for chemical contaminants. 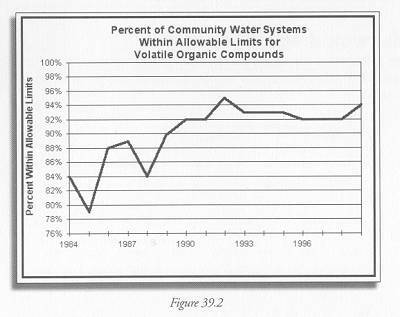 For volatile organic compounds the figures rose from a low of 78 percent in 1985 to 94 percent in 1999. The situation has clearly improved over time. The major human sources of drinking water contamination are industrial pollution, urban and agricultural runoff, and industrial discharges into surface water supplies. The United States has been effective at managing point source pollution from factories and sewage treatment plants, through the Clean Water Act and other legislation. The management of runoff is more difficult. Runoff comes from thousands of small, dispersed sources, including agrochemicals that wash directly into streams in the rain, car exhaust and lawn chemicals that flow into storm sewer systems, and other small sources that are very hard to pinpoint. Natural sources are even more difficult to manage. For example, many urban streams have high levels of biological contamination from wild geese and ducks, which cannot easily be controlled. Drinking water safety is achieved in two ways; pollution control measures to protect source water and treatment before the water is used. Drinking water quality is monitored as the water leaves the treatment plant. If the pipes through which the water travels to homes are not well maintained, additional contamination can be introduced into the water, so these data could overestimate the safety of our water. The US Environmental Protection Agency has introduced a source water protection program for drinking water, through which each state must develop a plan for monitoring and maintaining the safety of its drinking water supplies. This program should help us compare the effectiveness and feasibility of protecting water at the source vs. treating it before we drink it. In most cases some balance between these two strategies is likely to be the most efficient way to guarantee the safety of our water supplies. The contaminants measured here are only a portion of those suspected to be detrimental to human health. These data do not include contaminants receiving increasing attention in recent years, such as growth hormones used in animal husbandry or antibiotics and other medications that have become common in our source waters with increased human use. Understanding the significance of these contaminants is important to ensuring that our water supply is safe. 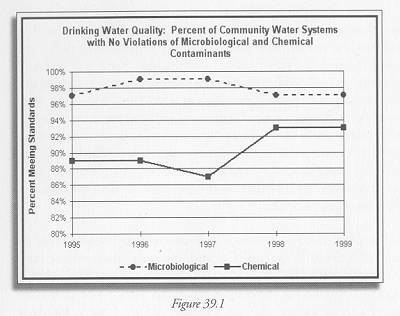 Figure 39.1 Drinking Water – microbiological and chemical compliance. Department of Environmental Protection’s Leading Environmental Indicators Fact Sheets. http://www.state.nj.us/dep/indicators/dwmicrochem.pdf. Drinking Water – VOCs. Department of Environmental Protection’s Leading Environmental Indicators Fact Sheets. http://www.state.nj.us/dep/indicators/dwvocs.pdf. By 2005, 95% of the public water systems will provide water that meets the microbiological and chemical drinking water standards.